PHILADELPHIA – Jamaica’s Minister of Tourism, Hon. 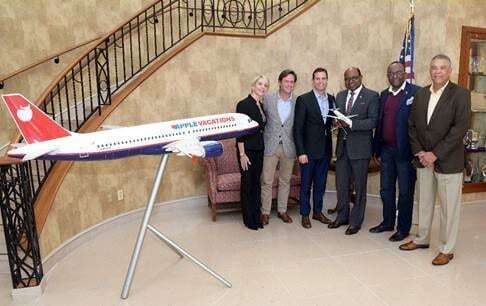 Edmund Bartlett met recently with the new leadership of Apple Leisure Group at its headquarters during a visit to Philadelphia. The Minister was joined by Jamaica’s Director of Tourism Donovan White and Deputy Director of Tourism Donnie Dawson. Apple Leisure Group is now the largest tour operator in the United States following its merger earlier this year with The Mark Travel Corporation. L-R: Lynn Torrent, Executive Vice President & President of Distribution; Javier Coll, Executive Vice President; John Hutchinson, President; Minister Bartlett, Donovan White, Jamaica’s Director of Tourism and Donnie Dawson, Deputy Director of Tourism. The Group’s brands now include Apple Vacations, Travel Impressions, CheapCaribbean.com, AMResorts, Amstar, Worldstar, Unlimited Vacation Club, Funjet Vacations, Southwest Vacations, United Vacations, Blue Sky Tours, My Destination Wellness, Mark International and Trisept Solutions. Jamaica’s Minister of Tourism, Hon. Edmund Bartlett (right) makes a point during a recent meeting with new the leadership Apple Leisure Group at its headquarters in Philadelphia. Looking on is Jamaica’s Director of Tourism Donovan White (center) and Deputy Director of Tourism, Donnie Dawson.